Recently, Windows 10 internal build leaked online with many new features. Now one more feature discovered in the leaked build, it’s a new Green Screen of Death (GSOD). 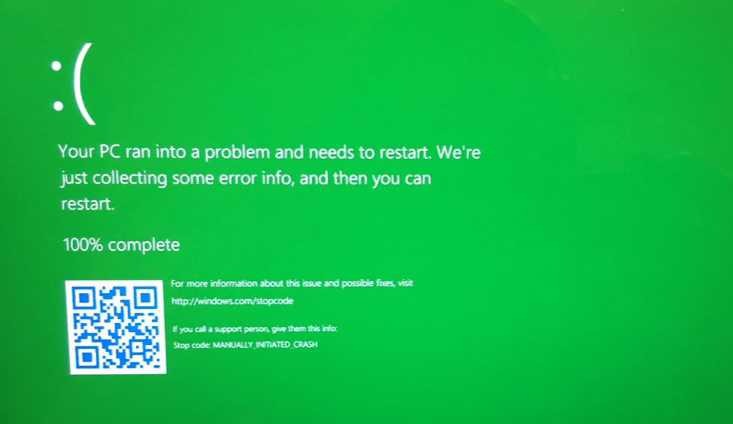 This new GSOD will replace Blue Screen Of Death (BSOD) for insiders only. Previously, Microsoft employee Matthijs Hoekstra hinted that there is one big change everyone is missing. According to Hoekstra, Microsoft is making the BSOD green on Windows 10 Insider Preview releases so that it’s easy to distinguish between Production and Insider releases. This new change will help Microsoft while providing support to customers. The company will easily be able to determine if a user is running an Insider release or a Production build. However, it’s just a color change, the pain will remain the same.